AND MORE MENU ITEMS HERE. MEANS MORE SHELF SPACE HERE. 30% LESS HEIGHT HERE. The company behind the brands you trust. V i s i t u s a t R F M A , B o o t h 9 0 6 THE SLIM CONTOUR UNIT COOLER BECAUSE EVERY INCH COUNTS. 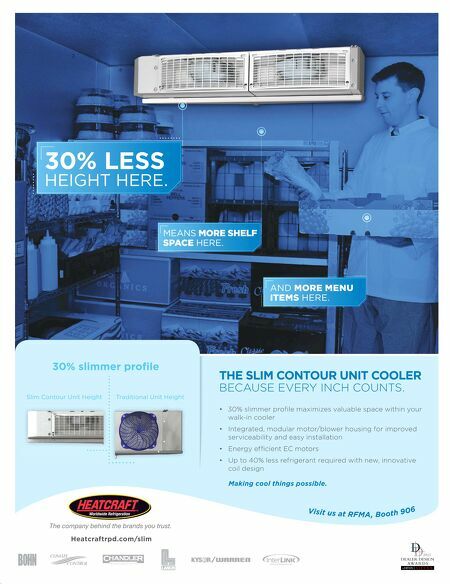 • 30% slimmer profi le maximizes valuable space within your walk-in cooler • Integrated, modular motor/blower housing for improved serviceability and easy installation • Energy effi cient EC motors • Up to 40% less refrigerant required with new, innovative coil design Slim Contour Unit Height Traditional Unit Height 30% slimmer profi le Heatcraftrpd.com/slim Making cool things possible.